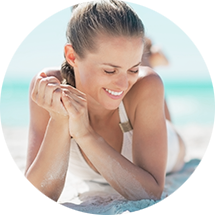 Board-certified San Diego dermatologist Deborah H. Atkin, MD and our team are pleased to introduce CoolSculpting®, an innovative, non-surgical procedure for reducing unwanted fat. CoolSculpting® uses a patented method called Cryolipolysis™ to precisely target and destroy fat cells in problem areas for dramatically smoother contours without surgery! During the procedure, a non-invasive applicator uses a gentle vacuum pressure to draw the skin and fat cells between cooling panels. CoolSculpting® then cools the fat cells. The cells crystalize and those cells break apart and are safely metabolized by the body over a period of weeks after your treatment leaving surrounding cells unaffected. Clinical trials show that eliminating fat with CoolSculpting® is safe and effective and does not harm the skin. Did You Know?Fat cells are uniquely susceptible to extreme cold. CoolSculpting® is a patented technology that harnesses the power of cold to reduce fat in the targeted areas. Effective fat reduction without surgery, anesthesia, or downtime. CoolSculpting® focuses on areas of fat that have not responded to diet and exercise, eliminating excess fat deposits without harming the surrounding skin. Length of Time for Procedure? There is no downtime with this procedure and you may return to full activity immediately. In rare cases, temporary bruising may occur at the treatment area. You may also experience mild tenderness for a few days to weeks after treatment. Final Results of the Procedure? Patients will notice an improvement in the area in approximately 3 weeks. The full benefit can be seen in 2-3 months. While results occur with a single treatment, results are additive with additional treatments. Other Treatments or Skincare Products that May Improve My Result? Patients having CoolSculpting® may also consider Thermage® to firm and tighten the skin. To help you determine if CoolSculpting® is right for you, Deborah H. Atkin, MD has provided answers to frequently asked questions (FAQs) about this popular procedure. For additional information, please contact our practice to schedule a consultation. If I have CoolSculpting on my abdomen will the fat move to another area of my body? No. The affected fat cells will be excreted out through your urine, or burned as energy. Those fat cells are gone, but if you were to gain weight in the future you may notice the weight being evenly distributed over other body areas or actually becoming more preferentially heavier in another area. Will I see a result when I go home that day? No. It will take about one month to see any improvement, then you will continue to see incremental improvements for up to 6 months post treatment. What is the difference between CoolSculpting® and VANQUISH ME™? CoolSculpting® destroys fat cells by using a patented Cryolipolysis™ (cold) system. The controlled temperature affects the fat cells, but does not adversely affect the skin, the skin will just get cold, then warm up once the device is removed. CoolSculpting® has been FDA approved and used to treat patients in the US since 2009. So, it has the longest track record and safety profile of any fat reduction device. VANQUISH ME™ uses a radiofrequency panel to cause a heat reaction that thins the fat cell wall, causing lipids to leak and the cells to collapse. While the heat is controlled, it can become quite warm and hard to tolerate. It is generally a series of treatments, 4-6, which typically are performed weekly. VANQUISH ME™ is a newer technology; it’s been available in the US since 2014. In our practice, we have experience with both CoolSculpting® and VANQUISH ME™ and found that the patient experience and effectiveness of CoolSculpting® surpassed that of VANQUISH ME™. How much will my CoolSculpting® cost? It depends on the number of areas we are treating and the amount of fat in each area. We offer a free consultation to give you the best idea. Will I have loose skin after my CoolSculpting® treatment? CoolSculpting® will not cause loose skin, but if you have laxity in the area we are treating you may notice the loose skin more after the fat has been treated. Most times the skin will retract back naturally after it has been unweighted through treatment. If you are wanting additional improvement or tightening in the treatment area we can discuss a combination of Thermage® or VelaShape® along with your CoolSculpting®. Do you have additional questions? 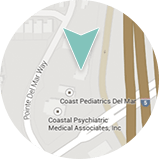 Contact our office or schedule a consultation with Deborah H. Atkin, M.D.